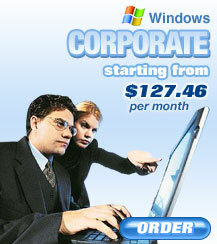 Get setup with a Virtual Windows Corporate Plan. This virtual hosting solution is a power packed plan for your corporate needs. If you need more or less power in the future, you can painlessly change plans with as much processor, memory, and disk as you need. Click here for more info.